Buyers Products SaltDogg 3.5-5 Cubic Yard Hydraulic Conveyor Chain Spreader gives contractors and municipalities a heavy duty, durable spreader that is ready for use with a truck's existing central hydraulic system. The 96 in., 108 in., or 120 in. 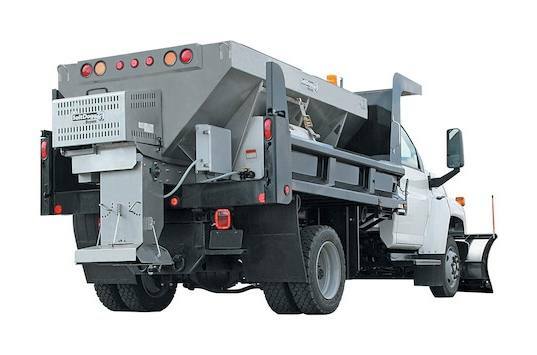 hoppers are designed for dump bodies and flatbeds with a minimum 15,000 lb GVW (gross vehicle weight) chassis. Its hopper, which comes outfitted with a top screen, and fully welded frame are made from high quality 304 stainless steel for long lasting corrosion protection. A SaltDogg stainless spreader is an investment made to last. The spreader is built to get the job done. It's equipped with a steel pintle chain conveyor and features a stainless steel inverted V to reduce stress on the drive line and improve flow. It's also outfitted with two hinged-top screens with 1/4 in bars. The high-flow conveyor is 14-1/2 in. wide with 1/4 in. crossbars, and has a stainless steel floor. An adjustable feedgate with lock pin offers additional material flow control. The conveyor chain is driven by a hydraulic motor with a 20:1 worm gear box. The spinner is power by a direct mount hydraulic motor. A 18 in. poly spinner casts material 2 ft to 30 ft. The spreader is available with a regular or extended chute. Two adjustable baffles allow you to cater the spread pattern to your use. The chute and spinner assembly flips up or detaches completely, tool-free, for convenient bulk unload, easy servicing, and access to towing. Hydraulic spreader controls are sold separately. A variety of options are available, including manual hydraulic, manual with load sensing, and electric over hydraulic (available with or without GPS). Overall Width (at top): 70.00 in. Spreading Width Range: 4 To 30 ft. Designed for dump bodies and flatbeds with a 15,000 to 19,500 lb GVW (gross vehicle weight). Hydraulic powered drive with two motors for conveyor and spinner operation. Available with 96 in., 108 in., or 120 in. hoppers with a capacity from 3.5 to 5 cubic yards. Spreads bulk salt, bulk sand, or a salt/sand mix. Versatile 14-1/2 in. chain conveyor drive. 18 in. poly spinner broadcasts up to 30 ft, using a regular or extended chute. Two chute baffles allow you to adjust the spread pattern to your use. Hydraulic spreader controls sold separately with variety of options available. High quality, 304 stainless steel construction for optimum corrosion resistance. Four hinged top screen with 1/4 in. bars included. Stainless steel inverted V reduces stress on the drive line and improves flow.